What are other general customer responsibilities? Respect the Priority and Courtesy Seating signs and give up your seat to those in need. Remove your backpack and hold it in front of you. Keep your backpack and belongings on your laps, so other customers can get a seat. Please keep your feet off the seats to avoid soiling the seats for the next customer. Small snacks are allowed. Litter must be taken with the customer upon leaving the bus and disposed of responsibly. 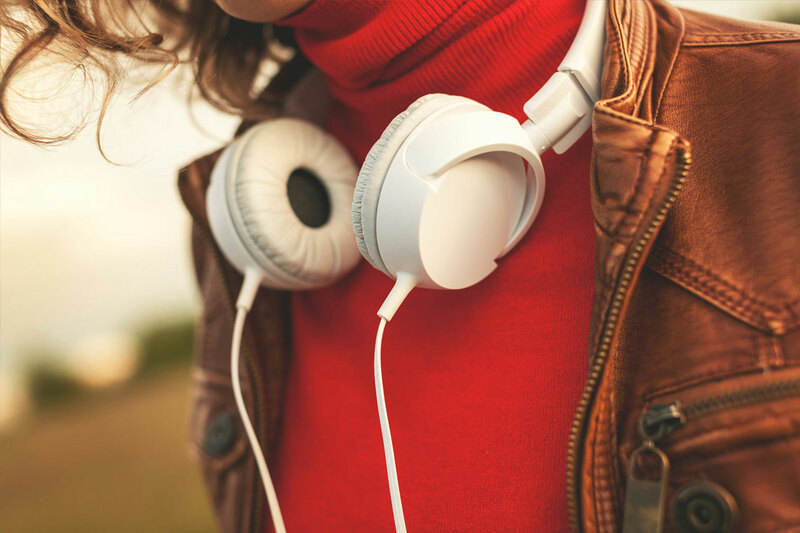 Listening to music with earphones is permitted. Please keep the volume low, so you do not disturb other customers or the driver. If you are on your cellphone, please keep the voice level down. Others do not need to listen to your conversation. Spitting, smoking (includes the use of e-cigarettes), consuming of alcohol or illegal drugs, vandalism, use of profanity, insulting or obscense language is strictly prohibited at any bus stops, stations and onboard buses. For a full list of Oakville Transit's policies, please visit the Oakville Transit policies and procedures page. How to read the bus schedule? Most routes have up to three schedules – Monday to Friday, Saturday and Sunday. Some routes change their routing during different times of the day, be sure to check the route map to understand which route the bus will take. Reading the schedule from top to bottom will tell you the direction of travel and how long the bus takes to travel between time points. Time points are major locations along the route, not all bus stops are listed on the schedule. The bus will stop at any bus stop between time points, unless the schedule indicates it is an express. If your bus stop is located between two time points, please refer to the times of the time point before your bus stop. Read across the rows to find the time closest to when you want to travel. Please be at your bus stop at least five minutes before the bus is due to arrive. A space with no time indicated or symbol "--" is shown, means that the bus does not service that time point. The bus will enter service at the first time point with a time, and go out of service after arriving at the last time point with a time. Flag stops are stops that do not have a physical bus stop sign. These locations are marked on the route map and usually on school routes. If you are at one of these locations, please flag the bus down to signal the driver to stop when your bus is approaching. When you want to get off the bus at a “flag stop,” ring the bell before the bus reaches your stop and let the driver know where you need to get off. How do I signal a bus to stop? Can I wait in the bus shelter? You are encouraged to flag the bus down if you are waiting for the Oakville bus in Mississauga, and at any bus stop that is used by two or more routes. If you are waiting inside the bus shelter, move to the curbside once your bus is in view so the driver will know to stop and pick you up. You may not be as visible to the driver if you wait inside the bus shelter. If the bus approaching is not your bus, take a step back to signal to the driver that you are not waiting for that bus. When you want to get off the bus, pull the bell cord above the window or press the stop button on one of the hand rails before the bus reaches your stop. Can I board or get off between bus stops? What is “Request Stop” program? In order to keep Oakville Transit buses on schedule, you can only get on and off vehicles at designated stops. "Request Stop" is a service available to all passengers after dusk on all Oakville Transit buses. 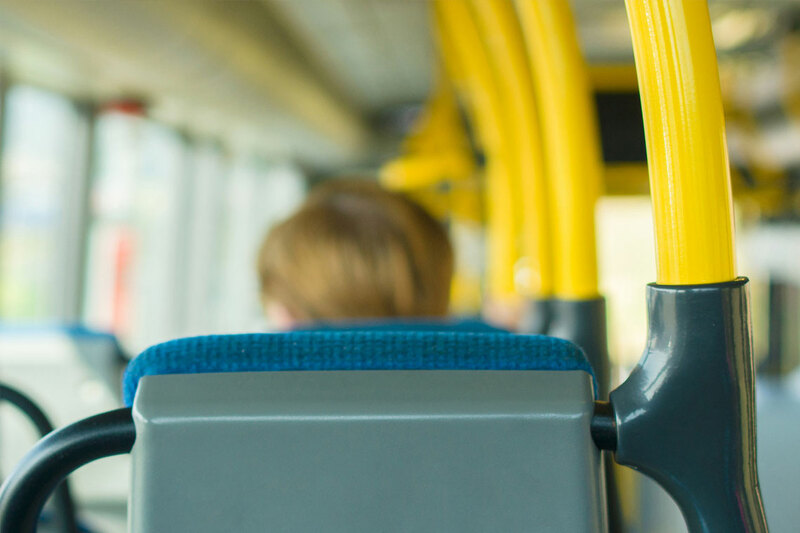 If you feel your personal safety is at risk, you can ask the driver to let you off along the bus route as close to your requested stop as possible. For added safety, "Request Stop" users are asked to leave by the front doors. You can pay with cash (exact fare - no change available on board), PRESTO card or with Oakville Transit special purpose paper monthly passes or tickets previously purchased from us. Valid GO Transit tickets with exact fare for the GO Fare Integration Program are accepted as well. In order to speed up boarding, please have your fare ready before you board the bus. For more information about our fares, please visit fares page. If you need to take more than one bus to your destination, a transfer is a proof of payment which entitles you to unlimited travel between bus routes and to any transit system (except GO Transit and TTC) within the two-hour transfer window. The transfer window begins from the time of the first boarding. 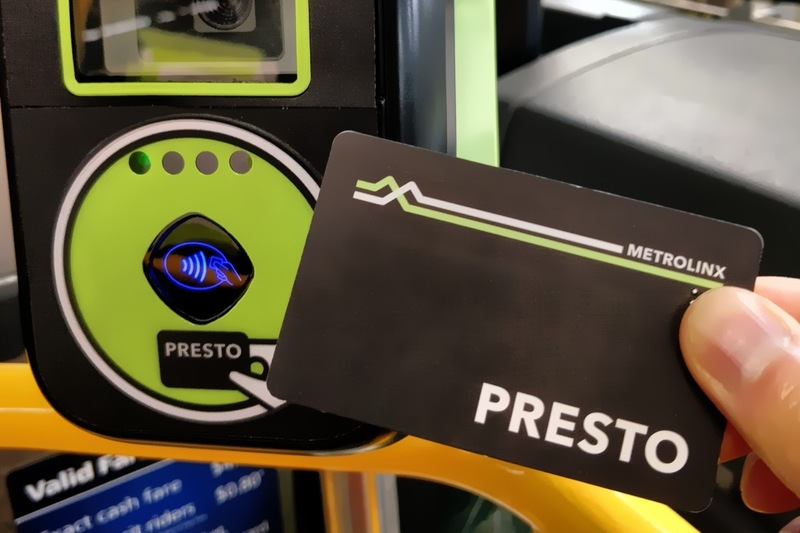 If you are using a PRESTO card, your transfer is automatically stored on the card, allowing you to travel for two hours from the time of the first tap-on. If you are paying by cash or special purpose ticket, ask the driver for a paper transfer at the time you board the first bus. Show the paper transfer to the bus driver each time you board a bus to verify that it is valid. For more information, visit time-based transfer in our fare policy page. I am transferring to Burlington/Mississauga/GO Transit, what is the transfer policy? Please visit connecting services page for details. Can I plan a trip online or on my smartphone? You can plan a trip online with the Oakville Transit Trip Planner by Google. You can plan your trip and access schedule information if you have the Google Maps app installed on your smartphone. You can also plan a trip using the Triplinx trip planner, designed for the Greater Toronto and Hamilton Area (GTHA). You can find schedule, fare and other information from 11 GTHA transit providers in Triplinx. Customize your trip by using the options such as maximum walking distance, cycle distance, transit mode and transit service providers you would like to use. Can I find out when my bus will arrive at my stop in real-time? Oakville Transit offers real-time bus tracking tools with the use of GPS technology to pinpoint the exact location of your bus and when it will arrive at your stop. You can track our buses in real-time by using the Bus Finder online tool, track by text, or our official mobile app. To learn more, visit our Real-time Bus Tracking page. Can I get updates about your service, alert about delays or detours? For updates on Oakville Transit news and planned service changes, you can visit our News & Service Updates page, sign up with our RSS Feeds to get information emailed to you, or follow us on Twitter @oakvilletransit. For service alerts, you can set up an account with our Real-time Bus Tracking tools - Bus Finder or mobile app. Once you have an account you can set up alerts based on the specific criteria you provide. You can receive service alerts and arrival notifications by email, and/or text message. You can go into your account at any time to add, delete or edit your alerts. Note: standard text charges may apply. All Oakville Transit buses are low-floor and wheelchair accessible. They have no stairs at the doors, can lower to curb level and deploy a ramp to make boarding easier for everyone. Each conventional bus can accommodate up to two wheelchairs. Our buses also provide automatic preboarding and next stop announcements, and digital sign to display next stop information. 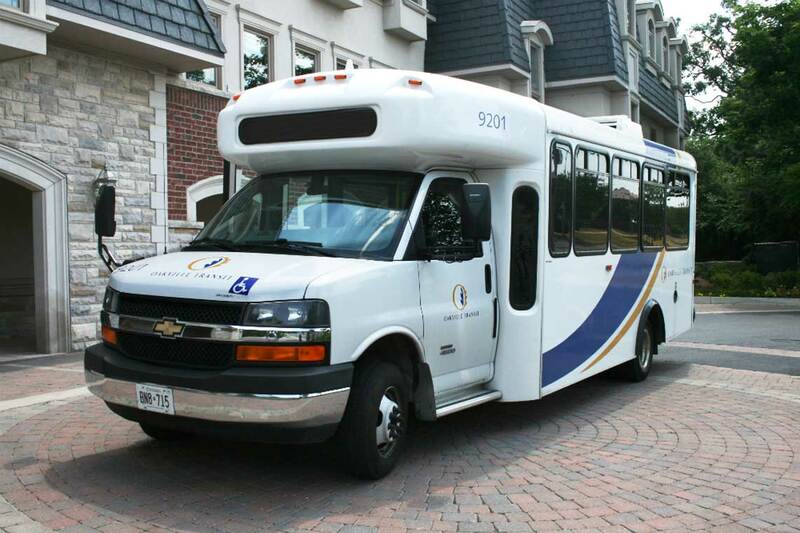 Oakville Transit also offers a door-to-door accessible service called care-A-van. For further information on accessibility, please visit our accessibility page. 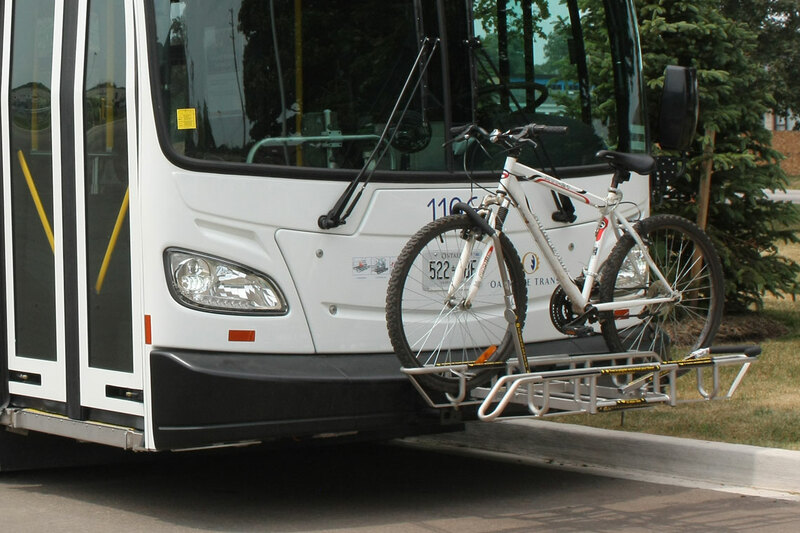 All conventional Oakville Transit buses are equipped with bike racks which can carry two bikes. In the event that a bike rack is full or inoperable and at the driver’s sole discretion, a bike may be transported onboard the bus. The comfort or safety of other customers must not be compromised and the bike cannot block the aisle. For more information on how to use a bike rack, visit the bike racks on buses page. Can I bring a stroller or shopping cart? When there is space, when other customers will not be affected or at the driver’s discretion buggies and other large articles may be allowed on the bus. The driver may decline to allow such objects at any time that he/she feels safety may be compromised. Customers are required to carry their own buggies or articles on and off the bus. For the safety of all customers, the aisles must not be blocked by such articles. Strollers may be carried on buses; however, for safety reasons, the child is to be removed from the stroller and the stroller folded and placed so as not to interfere with the movement of customers in the aisle. Service animals are permitted on board Oakville Transit buses. All other pets must be leashed and muzzled or contained in an animal cage. The driver may refuse to allow a customer to board with an animal if these conditions are not met. Exotic animals are not allowed on board the bus. Light snacks are permitted to be carried and/or consumed in an Oakville Transit bus. However, all food and drinks must be properly contained and any resulting litter must be taken with the customer upon leaving the bus and disposed of responsibly. Where do I find the full policies on Oakville Transit? I lost something on the bus, what do I do? Please visit the lost and found page for details. Who do I contact about bus stops or bus shelters? Garbage removal at the bus stops is done by the Region of Halton. Please contact 905-825-6000. Please contact GO Transit for bus shelters and other amenities at GO stations, as they are maintained by GO Transit. For all other inquiries or issues with Oakville Transit bus stops or shelters, please visit the contact us page. How do I report graffiti and vandalism? The town has a program to remove graffiti, please visit the report graffiti page for details.